So you are love struck! You know he is the one, and he feels the same way about you. You have made up your mind to take the plunge with him. But there’s just one glitch. He hasn’t popped the question yet. Really? Come on girls, isn’t man proposing the woman is already so 90s? Being the Gen Y girl, you don’t really need to wait for the man to bring up the ‘it’ question. You know what you want and how you want it. Take charge. Break all the conventions to make him yours. We are sure he will love it. Make sure to make it really special for him. And here are a few awesome ways to do it. If you are getting last minute jitters, then you needn’t worry. The first thing you need to do is to choose the right ring to suit your man’s personality. In case you don’t have enough time in your hands, we suggest you go online to pick from the massive range of wedding rings. For instance, we found this white and rose gold ring on CaratLane, suiting the tastes of the modern man. Once the ring is sorted, you can set your agenda and make the proposal, an entirely unique one. After all, how you propose, will be remembered and recited for the rest of your lives. So why not do it in style, do it with confidence, and do it with élan. Here are five unconventional ways to propose your man. Do add your romantic twist to it! You are sure about him but are afraid to propose to him straight away. If you both enjoy watching movies together then planning a romantic movie marathon will relax your tense nerves and give you the courage to pop the question. Ask him over to your place, then, order in or cook his favourite meal and you have the perfect setting to bring up the question. Look for the right moment as you enjoy the movie, and then all of a sudden, surprise him with the ring. A scenic setting is vital to pop the question. It could be a restaurant where you met him for the first date or a place you both often visit, just make sure it is of some significance to your relationship to ensure that the moment stays special. Visit this favourite spot, and once you are there, you can get down on your knees and propose to him. You may discreetly ask someone to take a picture of you together as you propose so that the moment remains etched in your memory forever. If your man is the fun-loving types who likes a bit of adventure, then you can send him on a treasure hunt that ends with your proposal. Spin the treasure hunt around things he loves like sports, music or even yummy treats. Start with a clue at home and then guide him through text messages to your favourite romantic spots in town. Finally end with the proposal ring and a handwritten letter placed in the end. It also adds a touch of mystery and discretion which we are sure he’ll love! 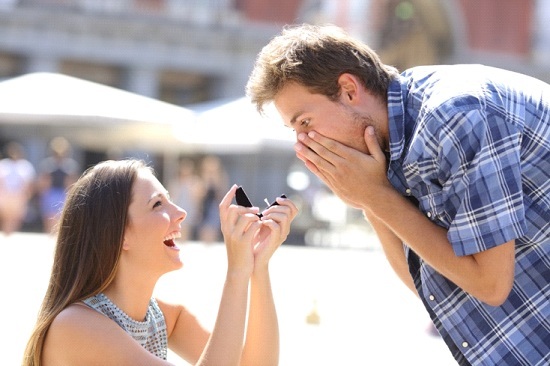 If you both aren’t shy, then plan the perfect proposal keeping your friends in confidence. You can even rope in his best friend into your plans if you know and trust him well. He can help you choose the right type of rings and words and also guide you about the best time to propose. Plan a night out with close friends at your favourite lounge bar or go out for a dance with friends. Finally, when the time is right, ask the DJ or the lead player to play his favourite romantic song while you propose on the dance floor. Get away from the hustle and bustle of city life and plan a weekend away on a beach or beautiful scenic place close by. What better place than a romantic seaside or a beautiful hillside amidst nature to propose to the man of your dreams? You can build a sandcastle together and when he isn’t looking just quietly put the ring on the highest tower. If you are amidst greenery, then plan a picnic together. As you both sip a glass of wine on a lazy sunny afternoon, arrange the surprise. To add to the excitement, get a caricaturist to sketch a picture of you two with word bubbles saying, "Will you marry me?" and "Yes!" If you are madly, deeply in love and have found the man of your dreams, we suggest, don’t wait for him to pop the question. Like a confident woman of today, go ahead and take over the reins and make him yours forever.